Elegant ~ silky ~ fabulous! Vibrant orange, gold and eggplant Succulent Agave Garden tapestry. Versatile chiffon scarf cape can be worn as a light cover up or a traditional scarf. 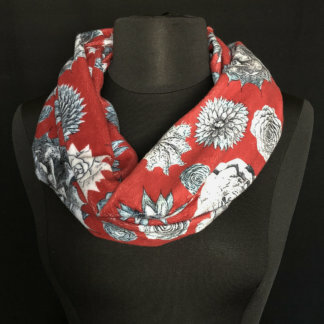 Easy to wear and perfect for a light summer cover, wrap, or accent to any outfit. 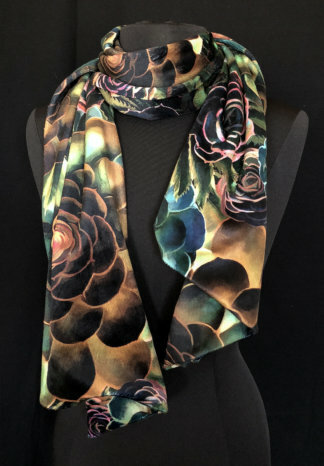 Makes a memorable gift for that special succulent lover, special gardener, birthdays, Mother’s Day, hostess gifts, teachers, or to treat yourself! 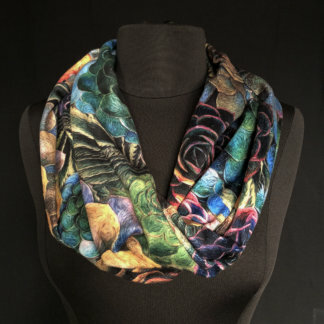 Uniquely designed succulent and botanical scarf capes are handcrafted in California. Gorgeous ultra-sheer and translucent 100% polyester chiffon. Machine rolled hem. Approximate size is 54 wide by 34 inches wide. One size fits most. Machine wash cold and hang dry or on low. No iron. **Please be aware that this scarf cape is individually handmade, so the layout of the fabric pattern may vary, but all are lovely!